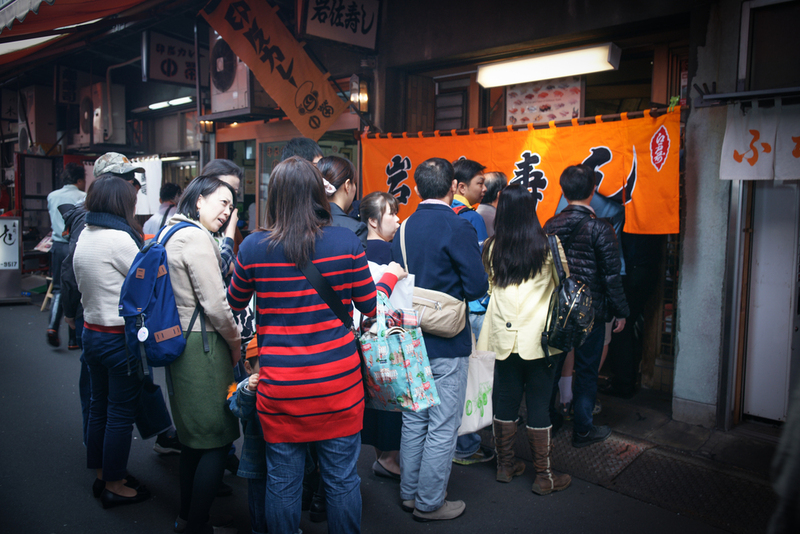 I was invited to the famous Tsukiji fish market with a couple of people. Luckily they had been there before and were able to help navigate through the massive crowds and choose a good sushi restaurant. As an added bonus, this restaurant had a very minimal line, and we only waited about 5 minutes before being seated. That was not the case at a lot of the restaurants. I have NO idea how long some people must wait in some of the lines that were outside of these places. Some restaurants had “waiting to see a panda” kind of lines! (**see Tokyo zoo post) No Thank You. At some of the places that had no one in them, the workers actually come outside and try to lure people into the restaurants. While right next door could be a restaurant with 30 people in line. The menus of the two places could be almost identical and considering that we’re in a fish market, I’m guessing the quality is pretty similar—so what gives? I don’t know if people “actually” know if one place is better or it is simply a “monkey see—monkey do” kind of thing. I know that it’s easy to see someplace that is really busy and just assume that it must be great. I guess I’ll never know because I’m usually too impatient to wait in line and find out! 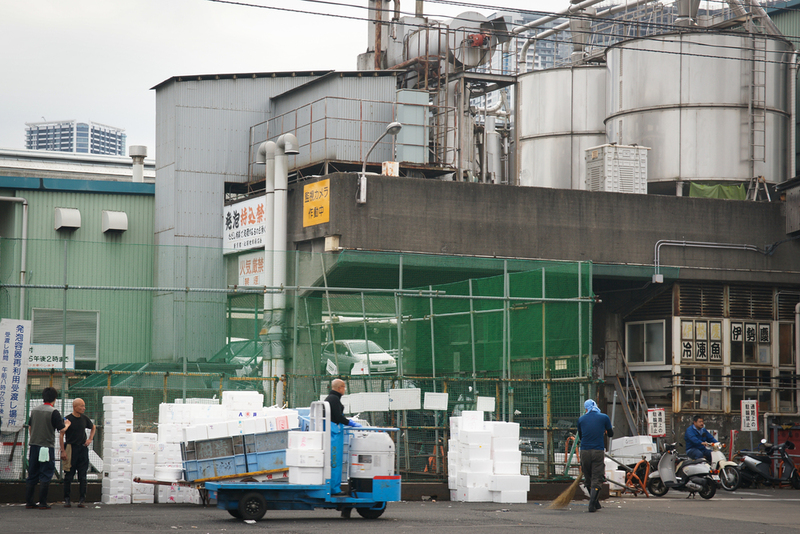 The market is famous for the fish auction that takes place very early in the morning, like 5 am. So needless to say, I did not see the auction. Plus I read that it is really busy, and they only let like 120 people in, so of course there are long lines that start even earlier than 5 (and if you know me, you know one thing I hate more than waiting in line, it’s getting up early!). The fish market is not just a spot for tourists. 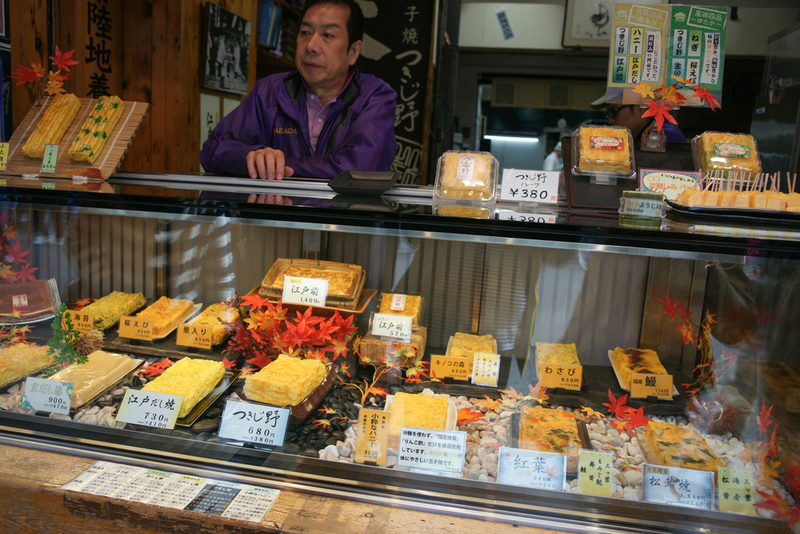 Tons of businesses are there buying and selling fish and produce that supply restaurants from all around. So, add to the number of local vendors, who are there for legitimate business, the number of tourists that are there to “witness” it all, and it becomes a real madhouse. The aisles of the market are tiny and the intersections where the aisles cross are so crammed with people, you can hardly move. Even when you get out of the main aisles where the majority of the people are, you end up on the outskirts where you’re liable to get run over by the trucks and motorized carts whizzing around. 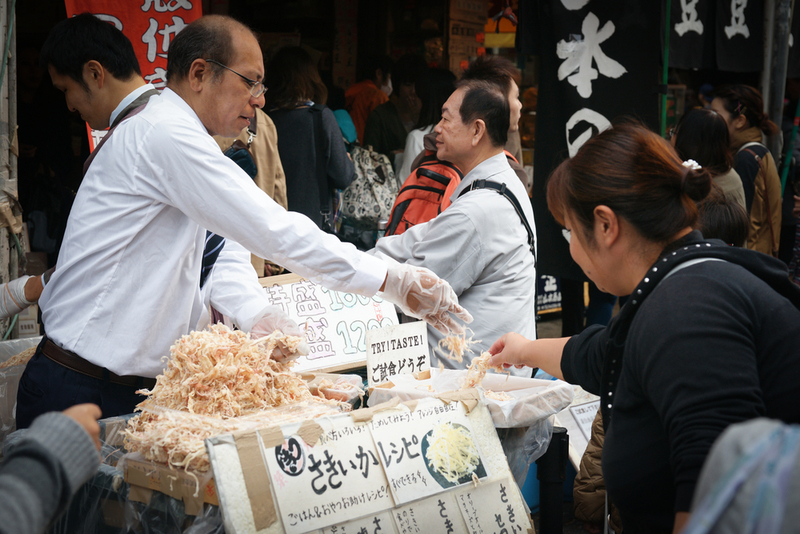 Lets just say, if you like crowds, fishy smells, the trill of almost being run over, the freshest sushi around, Japanese omelettes, long lines, or any combination of these things—the Tsukiji fish market is the place for you! If you prefer someplace with a little less hustle and bustle, you’re in luck. There is a great garden to visit within walking distance of the market, Hama-rikyu Gardens. It was a stark contrast from the madness of the market—air that smelled of the ocean (not seafood) and an overwhelming sense of calmness. Like some of the other gardens I have visited in Tokyo, it is towered over by large skyscrapers. This garden is surrounded by water, two rivers and the Tokyo Bay. You can also catch a waterbus from inside the garden that can transport you to several different places like Asakusa or Odaiba. 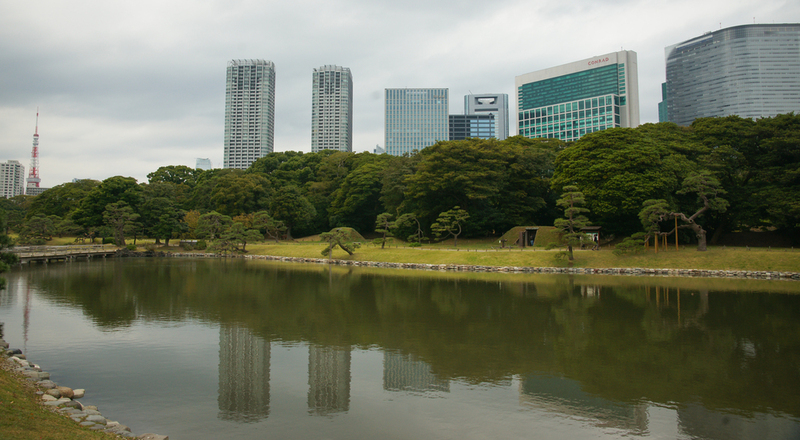 The serenity inside the Hama-rikyu Gardens was the perfect way to relax after the hectic pace of the market. Plus after eating samples from all the market shops and a big sushi lunch, walking along the garden paths was just what I needed to burn those extra calories!